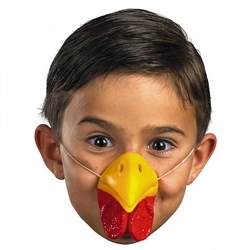 This chicken animal nose mask can be used for school and theatrical productions, as a Halloween costume, for year round dress-up fun, or for Easter. Pair this nose up with either a yellow, orange, or white outfit and feather boas for a quick, easy, and affordable costume. The Chicken Nose is colored as pictured with a beige color elastic band for comfortable one size fits most sizing. Pictured on a child but can be worn by adults as well!